A glittering blue diamond, once owned by European royalty, is set to be auctioned for the first time ever. Over 300 years ago, the Farnese Blue - a 6.16-carat pear-shaped diamond - was mined from the famed Golconda mines of what is present-day Andhra Pradesh. The dark grey-blue diamond will be auctioned off by Sotheby's next month in Switzerland and is expected to sell for anywhere between $3.6 million to $5.2 million. According to the auction house, the diamond was first presented to Spanish Queen Elisabeth Farnese and then passed down through four of the most important royal families in Europe: Spain, France, Italy and Austria. For 300 years, nobody - apart from close relatives and the family jewellers - knew of the sparkling gem's existence. It was kept secretly in a royal casket. "Like the famous Hope and Wittelsbach diamonds, the Farnese Blue was certainly found in the famed Golconda mines of India, which was the sole source of diamonds until the discoveries in Brazil in the 1720s," says Sotheby's. "It is difficult to put into words the excitement of holding between thumb and forefinger a gem discovered centuries ago, knowing it originated in the legendary Golconda diamond mines of India. 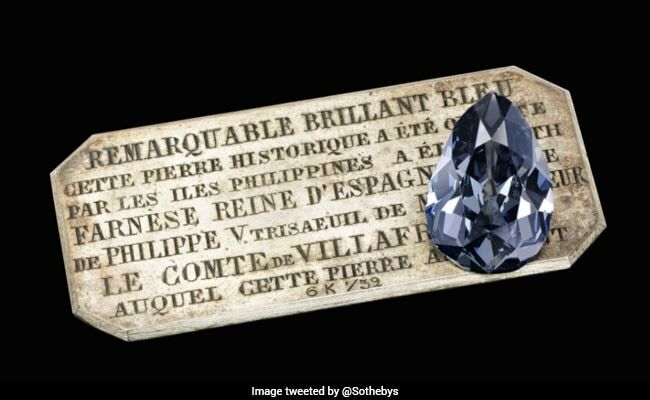 This stone has witnessed 300 years of European history, and in colour is reminiscent of historic Golconda blue gems such as the Hope diamond," says David Bennett, Chairman of Sotheby's International Jewellery Division and Co-Chairman of Sotheby's Switzerland. The auction house explains that blue has often been identified as the colour of royalty and in the 17th and 18th centuries, blue diamonds were viewed as the ultimate royal gift. "With its incredible pedigree, the Farnese Blue ranks among the most important historic diamonds in the world," adds Dr Philipp Herzog von Wurttemberg, Chairman of Sotheby's Europe. The stone will go on sale at Sotheby's Magnificent Jewels and Noble Jewels auction in Geneva on May 15 and is expected to fetch up to $5.2 million.